Cave goes for 14th National Title! There only one word to describe the presence of National Master Christo Cave (right) on Trinidadian soil… dominance. Winning an unprecedented 13 championships, the nation's top-rated player is currently attempting to defend his crown against the strongest opposition in years. Returning to the national finals will be four FMs (Ryan Harper, Mario Merritt, Frank Yee, Michael Pouchet) two NMs (Yogendranath "Yogi" Ramsingh, veteran Cecil Lee) and 2002 Olympiad bronze medallist, Ravishen Singh. Rounding out the field are: Sean Perryman, Dr. Edison Chang, Haydon Lee and David Christopher. Several in the field have won national crowns with Harper being the one breaking Cave's streak in 2002. 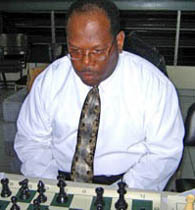 According to the island's chess website, Cave escaped defeat only when his opponent David Christopher missed mate in three. Ramsingh was upset by Hayden Lee, a first-time entrant in the national finals. The "round robin" tournament will last 11 rounds and is taking place at the Rooftop Rhand Credit Union, Abercromby Street.